Modern, reinforced plastic windows are commonly equipped with top-quality fly screens. They are attached by the special latches, being easy take out and cleaned. The meshes are lightweight, so the process is not complicated at all. The accessories can be cleaned without any efforts, preferably outdoors, or, in the last resort, in a bathroom, if you leave in a tower block or apartment. You would need only the warm water, the stuff like sponges, brushes, wash-clothes, some perfect cleaning solution, and a garden hose to spray or wash the screens. A window washing brush and squeegee can be also used to achieve better cleaning results. Using the traditional method of wire meshes cleaning. The frames can be propped against a wall for several hours or overnight to dry completely. If you live in an apartment, you can use a shower washing spray to clean the wire meshes. So, this method is easy and simple. The only complication would be to remove or reinstall the second story windows’ accessories. A ladder or a stool would be necessary. But, how to clean window screens that cannot be removed? Let’s check. If you leave in an old house with the classic wooden windows, the mesh could be not removable. The constructions can be old-fashioned, and even the cases when the meshes are nailed to the wooden frames happen. 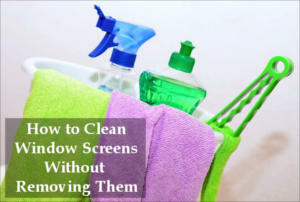 Quite naturally, you can simply and solely dust and wipe down the screens with dry and wet rags. Using a professional cleaning solution or just the water with soap and some droplets of ammonia would be essential. However, cleaning the meshes from the inside could be not sufficient in this case. So, if you live not on the first story or not in your private house, cleaning the windows from the outside would be quite complicated or impossible, at all. Thus, the easiest way to clean window screens is using modern tools. As it’s necessary to keep the meshes clean, removing dust every week or even more frequently, vacuuming them is a perfect way out. Using the better window vac that is portable, lightweight, handy and battery charged, you avoid any fatigue or efforts, being able to complete the household chores within several minutes and flawlessly. Select the necessary temperature and the attachment. Turn the vacuum cleaner on and pass the nozzle or the nylon brush over the vertical surface. Spray some water to remove the stains. Empty the water tank after vacuuming. Everything is very simple and clear. Quite naturally, the windows and to be kept in good condition, as well, but if you live in a 25th store, it may be not as easy as in a private house. If your window is not designed to be sliding, you prefer to save on the professional cleaning services and it’s not possible to reach your story from a ladder, commercial window squeegee would be pretty helpful. Actually, cleaning a window behind a screen is quite complicated. Any rags, sponges or brushes would not be quite efficient. Perhaps, only a task-orientated, professional window screen cleaning machine, a vacuum cleaning or window vac could cope with this challenging task. So, cleaning the windows and wire meshes with traditional means like sponges, brushes, and soap is possible, when your window screens are removable. However, using modern, advanced and handy tools and cleaning solutions is quite beneficial, as they save your cherished time and efforts.